Several years ago, my husband and I ordered some aronia wine on the Internet. The entire contents of the bottle landed in the sink. 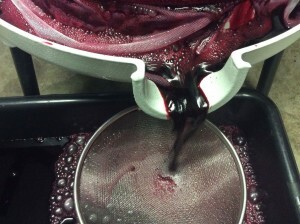 More recently, skilled winemakers are proving that aronia makes good wine. Two of the wineries are Randy Albrecht’s Wolf Creek Winery in Coleharbor, North Dakota, and Gerry Godfrey’s Mount Zion Winery in Marydel, Maryland. 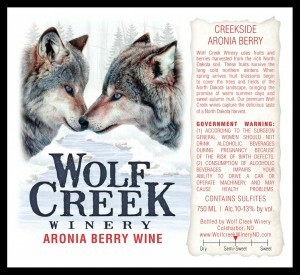 This label graces an Aronia Berry Wine from Randy Albrecht at Wolf Creek Winery in Coleharbor, N.D.
Albrecht’s $15.99 Aronia Berry Wine — a semi-sweet standout — won a bronze at the 2015 Wine Competition of the North Dakota Grape and Wine Association. Other Wolf Creek wines have won awards in other competitions. Godfrey’s Mount Zion sells a diverse quartet of aronia wines: Skinny Oak Aronia Wine, $16, Whole Notes Aronia Wine, $16, Party Foul, $16 and the apple and aronia Duet, $12. The collection attests to the fruit’s versatility. ‘We give our wines different treatment to accommodate different tastes,” Godfrey indicates. ‘Our four aronia wine styles have moved rather evenly.” The two winemakers will compete against each other this year. 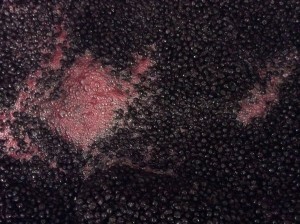 Both winemakers experimented to get the product they wanted. Godfrey teamed with a nearby winemaker. Godfrey also varies fermentation, but for approximately two weeks, ‘based on fermentation speed, temperature, fruitiness, aromatics, color and skin thickness.” He prefers a darker wine and feels that it has more character. ‘We bought 100 pounds to try, then last year bought all we had room for,” Albrecht says. 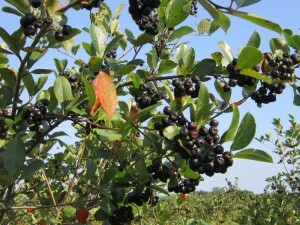 He observes that aronia is, ‘significantly more expensive than grapes. … (In my area,) it’s a seller’s market — more demand than berries.” He’s growing a small stand of his own. 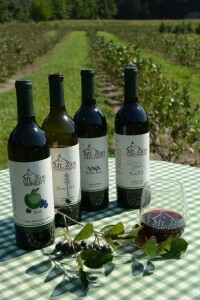 The Marydel winery supplies aronia from its own orchard and purchases from other growers. Mildred Culp, Ph.D., is communications director at Coldbrook Farm Inc. Email mildred@coldbrookfarm.net. 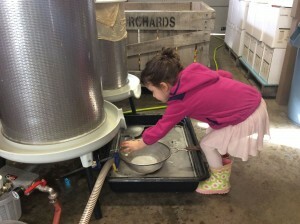 Copyright 2016 Coldbrook Farm, Inc.
A ballerina, the winemaker’s granddaughter, checks for quality assurance in pressed apple juice destined for Mount Zion Orchard’s Duet, an apple/aronia blend. 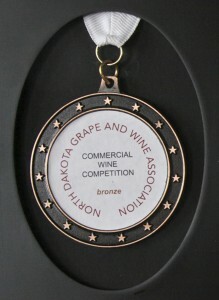 Judges at the 2015 Wine Competition of the North Dakota Grape and Wine Association conferred a bronze on Randy Albrecht’s Aronia Berry Wine from Wolf Creek Winery in Coleharbor.